I quite like Chilli Heatwave Dorito crisps, and can often be found munching on them either a Friday Night or Saturday nights, so I was really thankful to Krys who I have been friends with for a long while for sharing a recipe link to make homemade Doritos. Krys said was going to make a vegan variation of this recipe; and I responded back that I would make a vegetarian version as the recipe used Parmesan cheese as a flavouring. Parmesan cheese is not suitable for vegetarians as it is made with animal rennet. I found a good alternative: Old Winchester which is made in the UK and makes for a good vegetarian alternative to Parmesan. 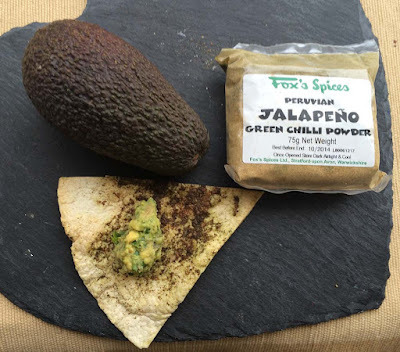 So when I started to pull together the ingredients to make this recipe including chillii and paprika, I was reminded of a packet of Peruvian Jalapeno green chilli powder that I have had for a long time unopened. I decided to use that instead of the chilli and paprika. I was rather impatient coating the green chilli concoction over the sliced triangular tortilla wrap pieces and it shows, but the taste result was awesome. It was really spicy. I can handle chilli kicks, but this was super duper spicy so to calm it down a little instead of my usual red salsa, I decided on making some guacamole. You know what, I make guacamole all the time, but have never ever shared it on my blog. I guess because blogosphere is covered in the green stuff, why bother with another guacamole recipe which is much of a muchness. Anyway, the green guacamole did tone down the heat. We also ripped open a packet of the Chilli Heatwave Doritos too and you know what, we could hardly taste the spice (compared to my home-made green version) as the sugar dominated. Its amazing the difference when you make something at home and compare. We would never have noted the overwhelming sweetness had we not made them at home. 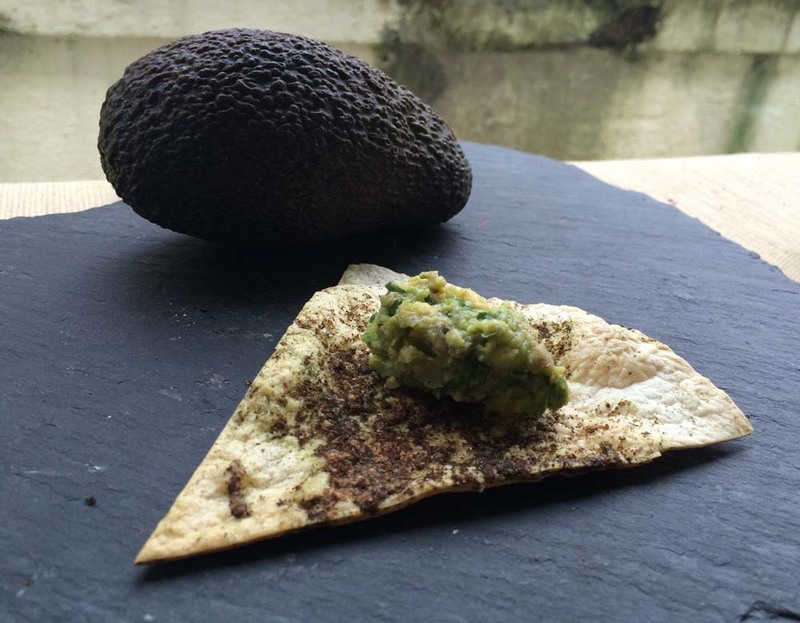 I am sharing this with Credit Crunch Munch hosted this month by Travels for Taste and often co-hosted by Fuss Free Flavours and Fab Food For All. Brush each of the tortilla wraps with the oil. 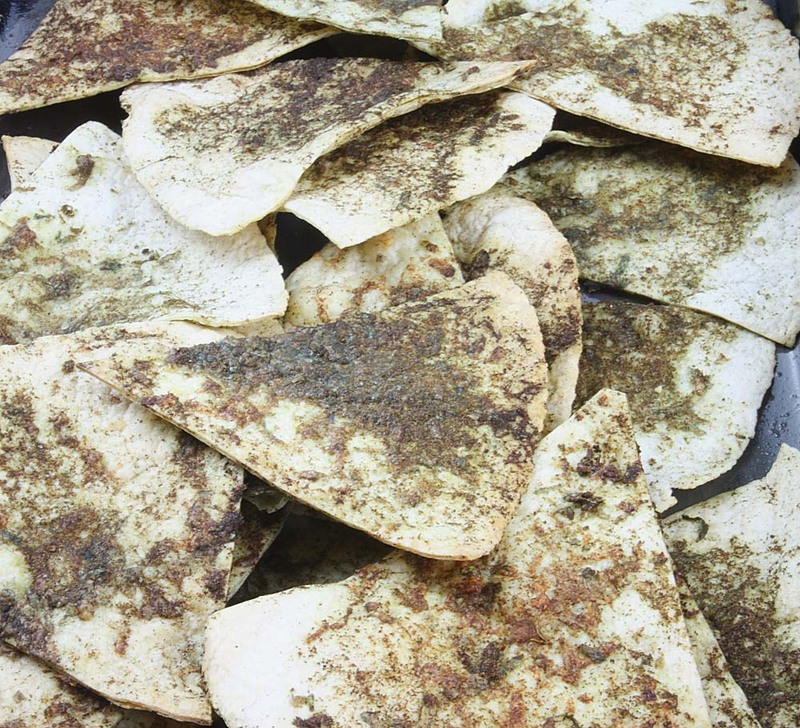 Then slice in 6 - 8 wedge/triangular pieces. In a wide bowl, add the cheese, the spices and slat and stir well. Then throw in the tortilla pieces until well coated. Lay on lightly oiled baking sheets. Bake in oven gas mark 5/200oc for 15 minutes until golden. Remove from oven and allow to cool, before tucking in. Serve with your favourite dip or with guacamole. Thanks again to Krys for inspiring me to make this recipe. Check out her vegan food blog Dine In, Not Out and craft blog Vegan Stitch. For the original Dorita recipe click here. 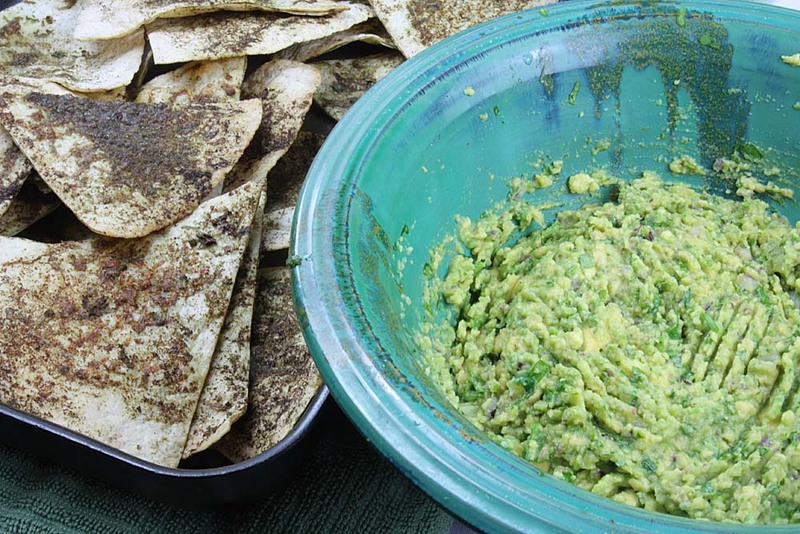 For the guacamole - make your own, everyone has their own adaptation of this Mexican dip. These sound awesome! I must say that I've never been a fan of Doritos, but I think it's the sweetness that puts me off, although I'd not actually thought of that before. I'll definitely be trying these - and if I'm lucky, I may have some homegrown chili powder to use this coming summer! Thanks Margaret, I never noticed the sweetness until I made my own, and its put me off actually. Hope you get to make these with your own chilli powder, green or red! Your homemade version sounds much better than the original - and yes, perfect for watching Game of Thrones! We are terribly behind as don't have Sky TV and in Australia borrowed the DVDs from family. Yum, these sound delicious. I've got tortillas in the cupboard, I should turn them in to chips too! Thanks littleveganbear. hope you try a variation of them at least. What a neat idea and I also really like the Old Winchester cheese! Winchester cheese is a good cheese, I never liked Parmesan ever, the smell always reminded me of baby sick. Delicious! I love this kind of food. Thanks for following me on my new odyssey! Thanks you Rosa. And you so welcome. Lucky them! Once again, thanks for sharing the link Krys. Thank you Helen and so much more spicier too.